Port Victoria, Seychelles (CNN) — The cruise ship Costa Allegra, disabled two days ago by an engine room fire, is due to arrive in the Seychelles Thursday, Costa Cruises said Wednesday. Passengers and crew will be put on planes and sent home almost immediately, the Indian Ocean nation’s tourism chief said. Costa Cruises said it had secured 600 plane tickets and 400 hotel rooms. There are more than 1,000 people on the Allegra. With power out, they are using mineral water for washing, Costa said. They have a supply of cold food including fruit, cheese and cold cuts, and fresh bread is being flown to the ship by helicopter, the company said. A large French fishing ship began towing the liner to port on Tuesday. A Seychelles Coast Guard ship reached the Costa Allegra later in the day, along with two tugboats from the Seychelles Ports Authority, said Seychelles presidential spokeswoman Srdjana Janosevic. The ship was being escorted to Port Victoria, the Seychelles capital, she said. The Allegra lost power in the Indian Ocean Monday with 636 passengers on board and a crew of 413, according to Costa Cruises. Most of the passengers are from Europe, but eight are from the United States and 13 are from Canada. Costa initially said Tuesday the ship was expected to arrive Wednesday at the Seychelles island of Desroches, but said later that after “extensive and accurate checks,” passengers could not get off on Desroches. 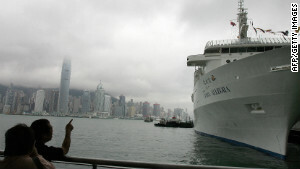 The ship is instead being towed to the Seychelles island of Mahe, where Port Victoria is located, the cruise line said. The ship departed from Diego Suarez, Madagascar, on Saturday and was originally scheduled to arrive in the Seychelles Tuesday.